An elegant and lightweight fencing solution, Recintha® N/L panels have a “V” shaped profile that gives a pleasing appearance to the property perimeter system. The wide range of colors available allows this fencing to integrate perfectly with the most varied environments, resulting effective and refined at the same time. 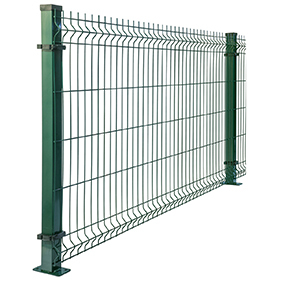 Thanks to the modular structure and the patented clip, Recintha® N/L becomes a strong, extremely adaptable and very quick to erect fence system to suite large fencing areas. It is available either in the classic version, with 2 23/64″ x 2 23/64″ square tube section or with 1 37/64″ diameter round tube post. 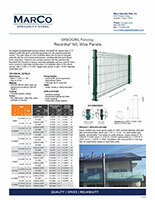 Electro-welded wire mesh panels made of 13/64″ nominal diameter steel wire with horizontal profiles. Mesh size 7 7/8″ x 1 31/32″. Post center-to-center distance: square section 6′-10 43/64″/6′-9 19/64″ and 8′-2 13/16″/8′-4 63/64″; round section 6′-7 21/64″/6′-8 33/64″ and 8′-3 1/64″/8′-4 13/64″. Installation with universal MP or crab-type clips for respectively square or round tube posts. We invite you to Contact Marco Specialty Steel today to learn more about the wide range of Recintha® N/L Wire Panel products and options. We’ll also be happy to provide a no-obligation quote.